Ack-ack attack: The journey home from a dance at the Walton Playhouse in September 1940 proved quite hairy for Jimmy, left, and Billy Brant, but fortunately they lived to tell the tale. WITH so much attention being focused on the new bridge at Walton at the moment, I thought you might enjoy learning about an event that happened at the river crossing during the Second World War that I heard about last week. It actually came about because of the ‘topping out’ ceremony at the new bridge when one of my friends from Bridge Marine boatyard – Alan – told me that I really ought to talk to a couple of his mates who had some amazing stories to tell about their experiences – and one in particular concerning the war. 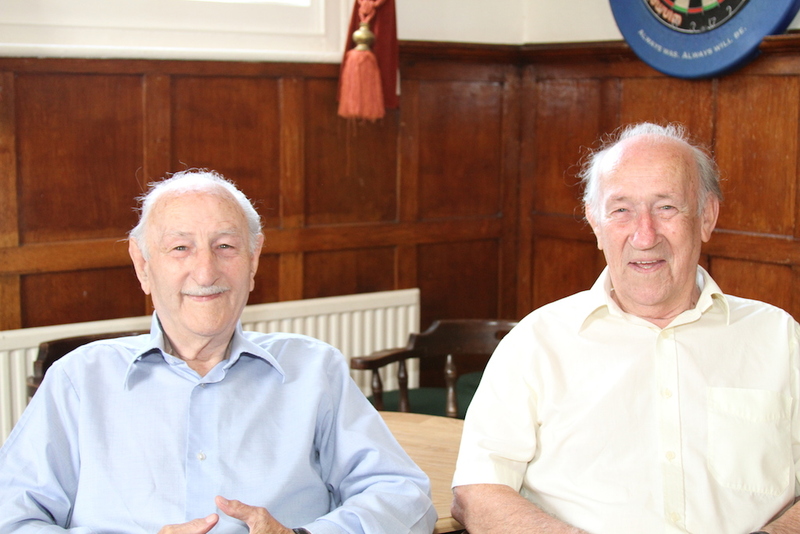 So I wandered over to the Wheatsheaf and Pigeon pub in Wheatsheaf Lane, Staines to meet up with Billy and Jimmy Brant – and what a lovely meeting it turned out to be. Billy, 89, and his brother, Jimmy, 91, have lived extraordinary lives together. Orphaned as small children, they were brought up in a children’s home and, being small lads, at the ages of 14 and 16 respectively, they were taken on as apprentice jockeys at the famous RC Dawson stables at Whatcombe in Oxfordshire. In 1940, when they were 16 and 18 years old, they moved to this area to be close to other members of their family – a decision that almost proved rather costly on a couple of occasions. Billy recalls: “In September 1940, Jimmy and I decided we were going to go to a dance at Walton Playhouse to see whether we could meet up with some young ladies – but we ended up taking our aunt with us – she was actually younger that we were – because her dad told her she could only go if she went with us. “At the end of the evening we came out of the playhouse and started walking towards Walton Bridge on the way home. “We heard the air raid sirens go off and then saw the searchlights and heard the ack-ack guns firing at the raiders but we didn’t think much of it – well you don’t at that age,” he said. The stick of bombs fell very close – one blasting a huge hole in Walton Bridge itself and another hitting a nearby greenhouse, which resulted in the three of them being showered in glass. Billy said the bridge appeared to be made up of wooden blocks – like parquet flooring he said – covered with a layer of tar that also ended up falling all around them. As it turned out, that was not Billy and Jimmy’s first encounter with the German air force because a few months previously they had gone for a ride on their bikes to Weybridge. The two lads dived for cover during the raid – which was devastating as far as the factory was concerned, killing dozens of workers and doing considerable damage. Billy said that afterwards when they spoke to people at the factory, many believed some of the pilots were racing drivers who had driven at Brooklands before the war, and knew precisely what they were aiming at which was somewhat ironic. It was a real pleasure to share Billy and Jimmy’s memories of those times – and I’m sure there are lots more stories to come from them!